We celebrated our youngest daughter's 10th birthday on Valentines Day. 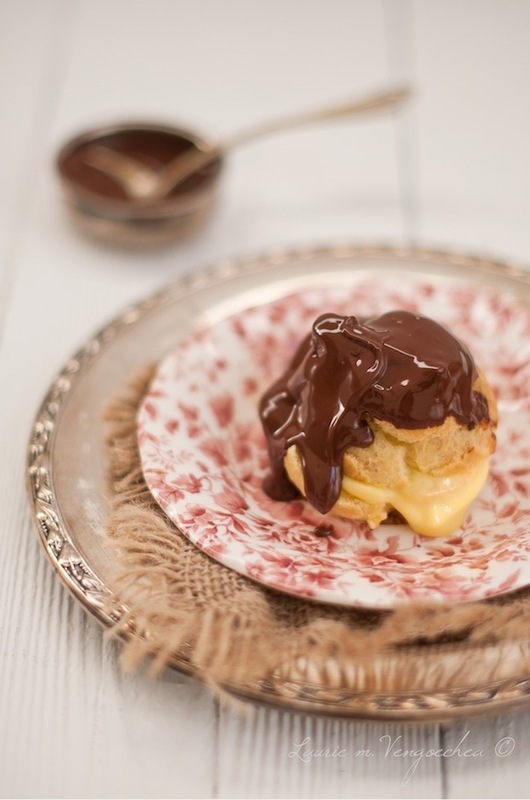 My little sweets request.. my Lusciously Rich Custard Filled Cream Puffs! They really are the best and never disappoint I hope you enjoy! In a saucepan on medium heat, combine the milk and the split vanilla bean; cook till it begins to simmer. Watch carefully so your milk doesn’t scald or you will have a skin on top. If you do notice a skin forming, remove it before you are ready to add it to your egg mixture. Turn heat off. Meanwhile, in a stand mixer or with a handheld mixer, beat eggs and sugar together until creamy pale yellow. You can also do this in a medium size stainless steel bowl with a wire whisk, but beat hard and consistently. (This is how I start my Zabaione when making an Italian custard) Next add the flour and beat hard till well incorporated and it has the texture of a thick paste. Slowly pour hot milk into egg mixture in a very thin stream whisking constantly to prevent curdling. When incorporated, remove vanilla bean. Scrape the seeds from the pod and stir them into the custard mix. Return custard to pan you heated the milk in and place on medium heat till mixture begins to thicken and come to a soft boil. Stir constantly and mix from bottom of pan to prevent custard from scalding. When it begins to come to a slow boil time it for another minute or so.. custard will be a medium consistency. Turn off heat. Add the 1 tablespoons of butter and mix well. Scrape the custard into a bowl. Smoothe plastic wrap directly on top of the custard. The first time I read this in directions I was kind of disconcerted thinking I would waste much of the top layer of custard when I pulled it from the top. When refrigerated and cooled, the plastic comes off clean from the top of the custard. No waste! In a saucepan, bring water and butter to a boil. Add flour and salt all at once; stir until a smooth ball forms. Remove from the heat; let stand for 5 minutes. Add eggs, one at a time, beating well after each addition. Beat until mixture is smooth and shiny. Drop by rounded teaspoonfuls 2 in. apart onto greased baking sheets. Bake at 400° for 20-25 minutes or until golden brown. Remove puffs to wire racks. Immediately cut a slit in each for steam to escape. Cool. Split puffs and remove soft dough. Cream Puffs are one of the things I would love to make. They are so a unique and impressive dessert. These look so good and sound delicious. 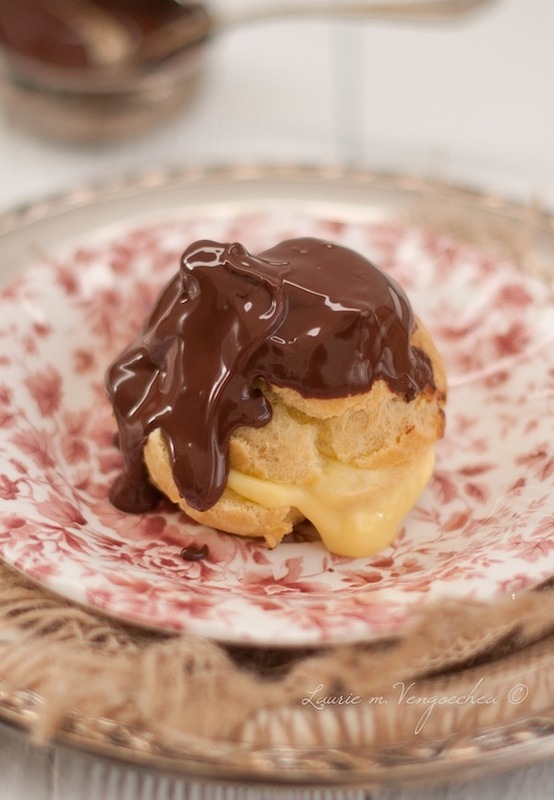 I've never made choux pastry, but your recipe makes me really want to try. Gorgeous Laurie, and Happy Birthday to your little sweetie! I love cream puffs filled with custard. I flavour mine with marsala or amaretto or sometimes both!! Family members have "who ate the most" competitions! Yours look delicious with the oozy chocolate dripping down! Mmmmmmm!